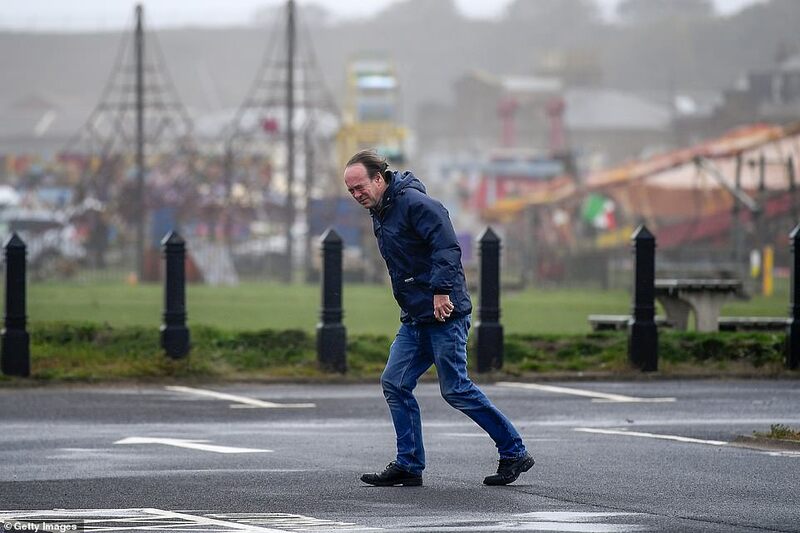 Storm Ali claimed two victims today and left hundreds of thousands of people without power while battering the British Isles with gusts of up to 102mph. 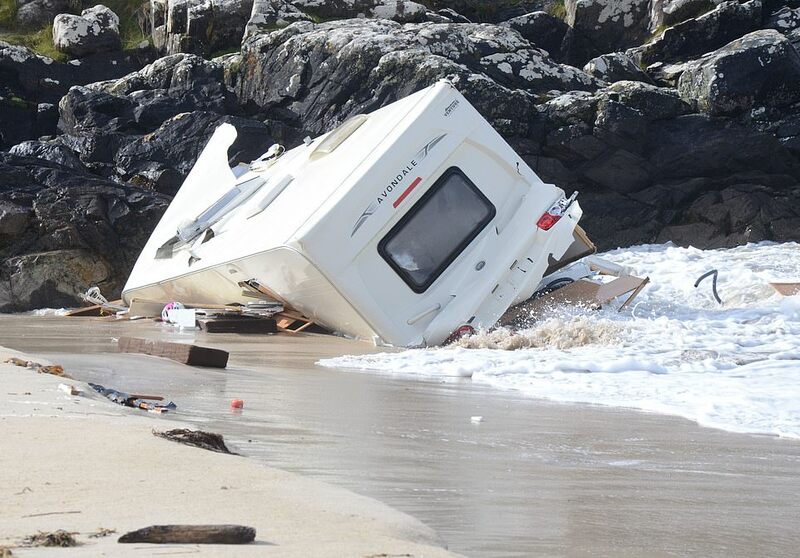 A tourist in her 50s died after her caravan was blown off a cliff as she slept in Claddaghduff, County Galway, in western Ireland this morning - while Britons were issued with 'danger to life' warnings posed by flying debris. And this afternoon a man in his 20s died and another in his 40 was injured when a tree fell on them as they worked in a country park in Northern Ireland at Slieve Gullion Park, near Newry, County Armagh. It is understood the men were doing contract work for Northern Ireland Water at the time of the accident. 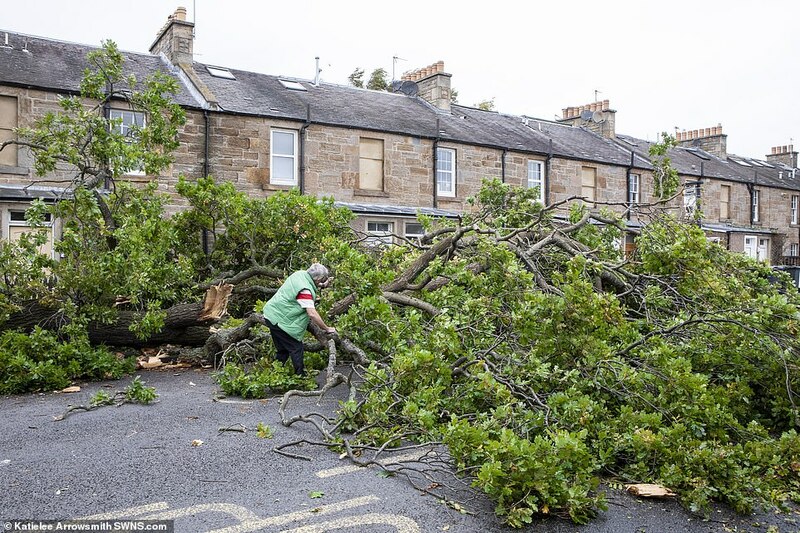 A total of 250,000 homes and businesses in Ireland have been left without power due to the bad weather bringing down trees onto cables – while 65,000 homes lost power in Northern Ireland and another 71,000 in Scotland. 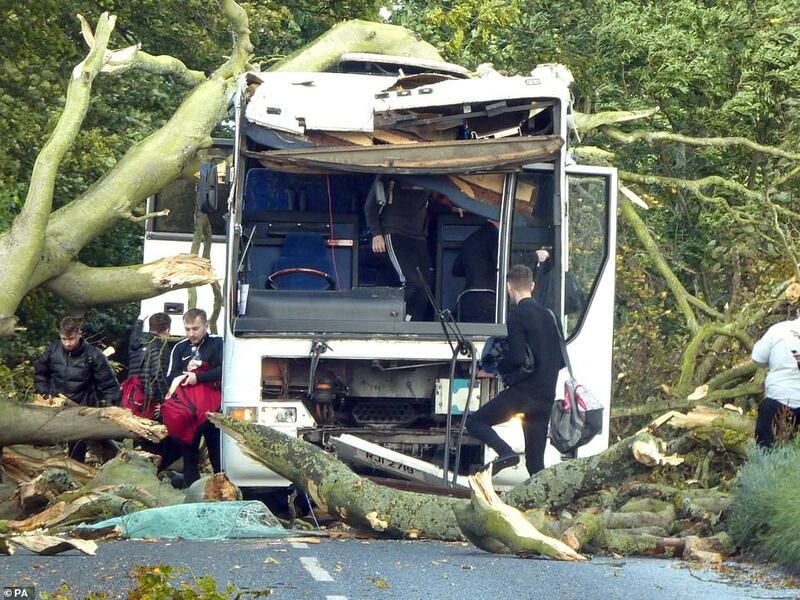 A university football team had a lucky escape after a falling tree crushed their team bus while it was en route to a game. The University of Dundee squad were travelling to St Andrews for a varsity match when the tree fell over and crushed their coach they were on board in Kincaple, near Guardbridge, Fife. It is thought one player was injured in the crash but that his condition is not serious and was treated for a minor head injury. 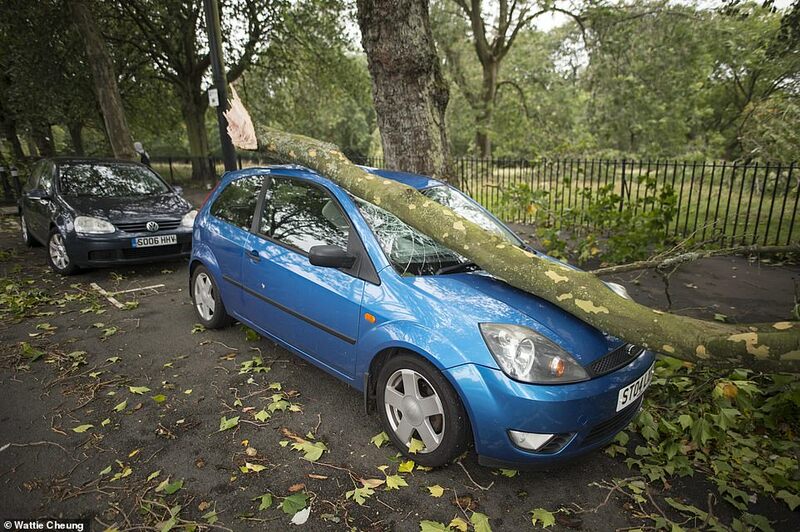 In Cheshire a woman was seriously injured after a tree fell onto her car this afternoon. 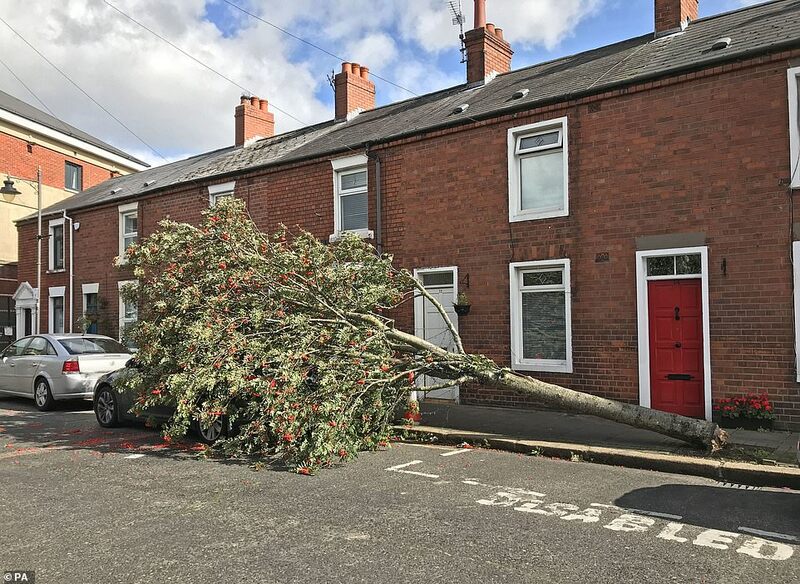 A spokesman for Cheshire Fire and Rescue Service said crews were called to the village of Tarporley just after 1.30pm when the tree fell on the car, trapping the woman inside. Firefighters worked with a tree surgeon to help remove the tree before cutting the roof of the vehicle off and freeing her. She was taken to hospital by air ambulance with serious injuries, Crewe police said. 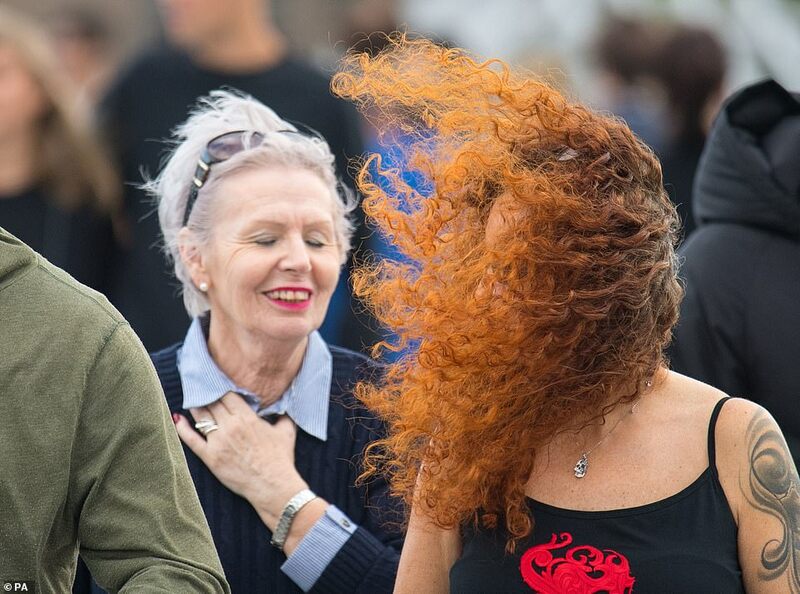 Forecasters in Ireland issued an orange wind warning, while in Britain there was an amber warning for the North of England, Scotland and Northern Ireland until 6pm. A major incident was declared in Dumfries and Galloway. The Ryanair pilot was pictured trying to land at Dublin Airport, before pulling up. Tug boats were called to a cruise ship, with 504 people on board, after it slipped its berth in Greenock, Inverclyde, in the west coast of Scotland when its mooring lines parted. 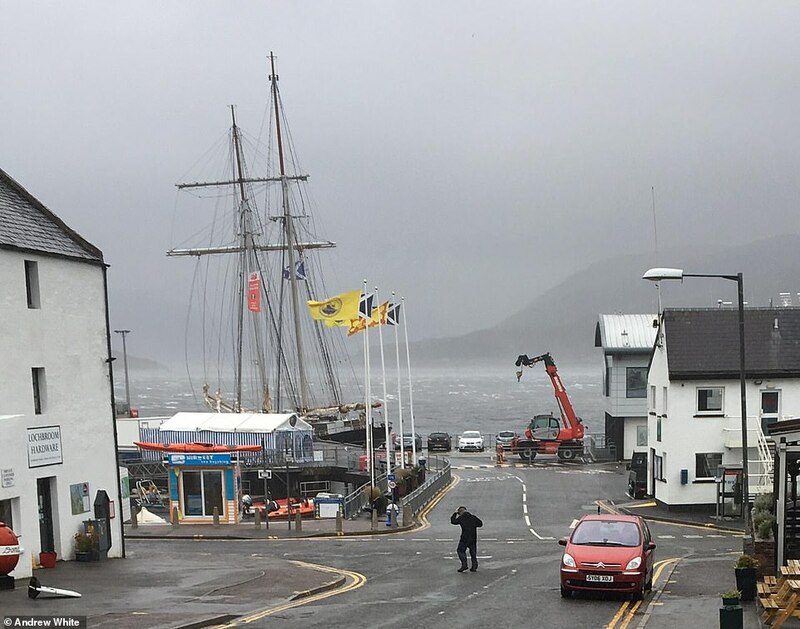 'Extremely strong' winds parted mooring lines at the Greenock Ocean Terminal at around 11am this morning and the vessel broke free, leaving it pointing straight against the quay. The ship has a capacity of over 600 and it is believed some guests were still on board at the time, along with members of the crew, while others had already gone on land to go sightseeing for the day. Owners of the Nautica said no one was injured as a result of the incident. Storm Ali has brought Northern Ireland its strongest September winds on record - with Killowen in County Down, recording a 91mph gust at 11am. 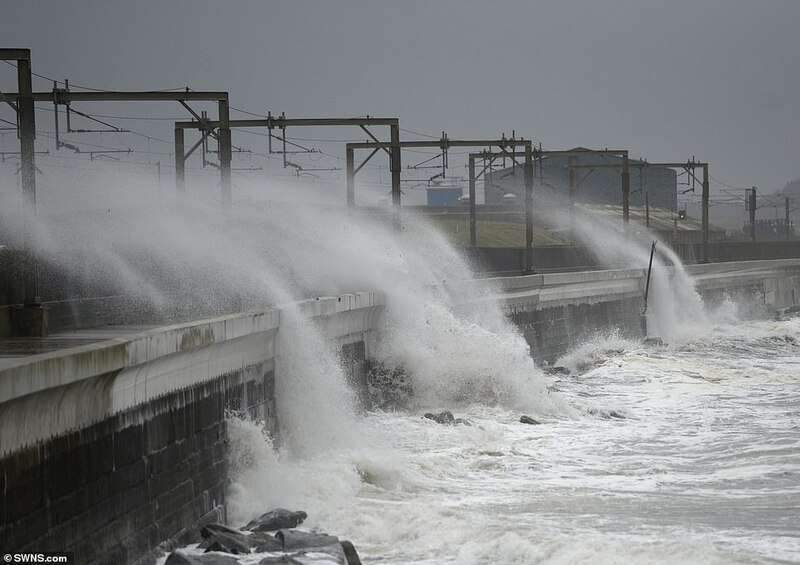 Meanwhile Tay Road Bridge officials said 92mph gales had hit the structure. In Claddaghduff, the woman was said to have been on holiday from Switzerland and had arrived just hours earlier. Emergency services attended the scene at about 7.45am, and a body was found after a search on Acton Beach. 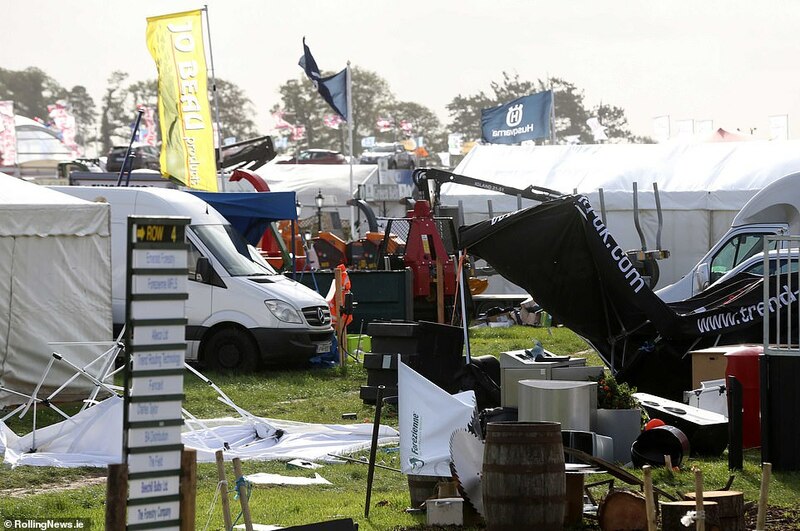 Mary Sweeney, the publican of Sweeney's bar in Claddaghduff, beside the campsite, told MailOnline: 'We're hearing the unfortunate woman was from Switzerland and she'd just arrived at the campsite yesterday afternoon. 'I don't think she was in the pub here last night because the weather here was ferocious and you wouldn't go out in it. It got even worse between 5am and 7am this morning and I believe that's when the accident happened. Irish President Michael D Higgins added: 'Today's strong winds can result in dangerous situations and I would urge everyone to heed the warnings by the authorities and take caution when travelling or when out in the open. 'I was deeply saddened to learn that Storm Ali has already claimed one victim today in Claddaghduff, Co Galway. As President of Ireland, may I express my deepest condolences to her family. Gusts of 102.2mph hit the Tay Road Bridge in Dundee at 3pm, according to bridge equipment. The Forth Road Bridge, Clackmannanshire Bridge and Queensferry Crossing have put restrictions in place - while the Tay Road Bridge was shut to all traffic. Elsewhere, tug boats were called to the Nautica cruise ship which slipped its berth in Greenock. Strong winds saw the vessel - which had 478 passengers and 26 crew - leave the dock after its mooring lines parted. There have been no reports of injuries. 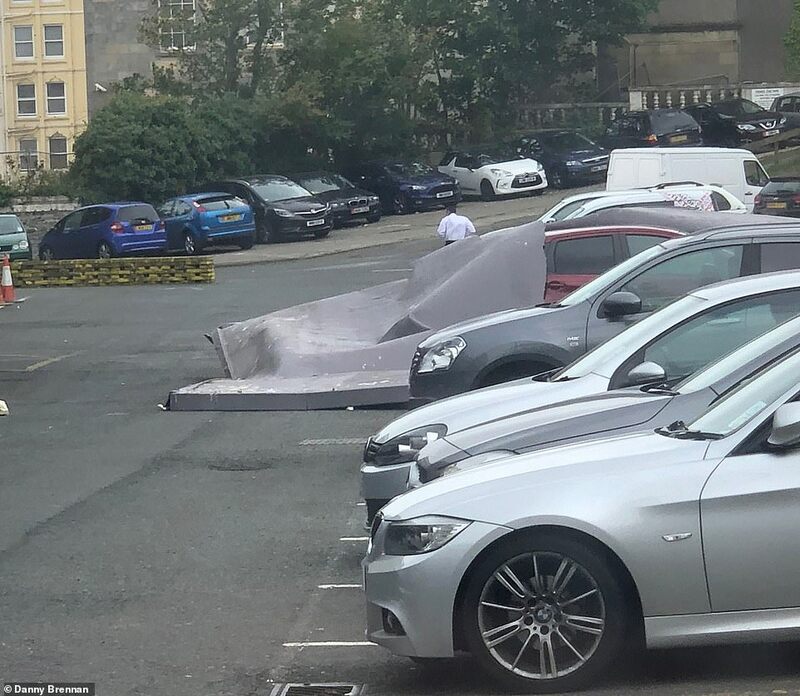 A section of Princes Street in Edinburgh was closed after parts of a shop roof flew off in strong winds. Police Scotland was alerted to lead falling from the Topshop building at around 12.30pm today. No one is thought to have been injured. 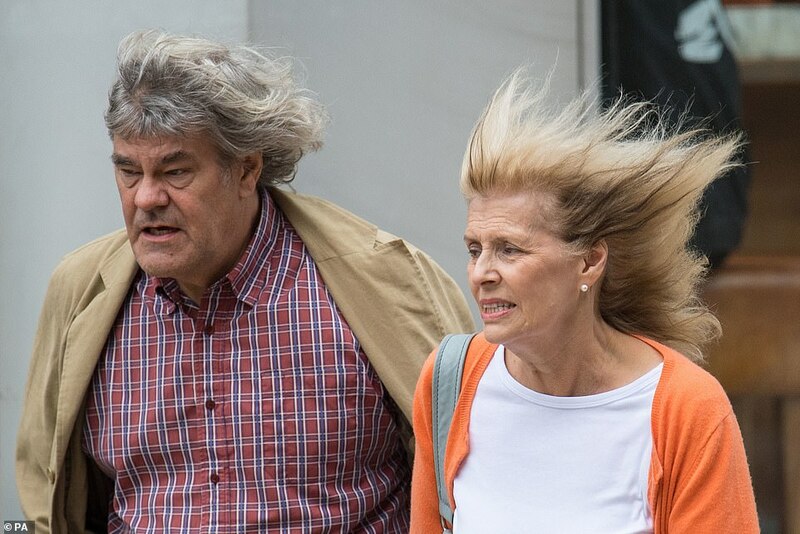 Two pedestrians - believed to be an elderly couple - were taken to hospital after being blown over in high winds as Storm Ali battered North Wales. An eyewitness reported seeing blood on the pavement following the incident outside a branch of Barclays Bank in in Llandudno, north Wales, at about 11.45am today. Two ambulances and a rapid response vehicle attended the scene along with the police. Emergency services were also called to rescue a man who became trapped beneath a digger in a river during strong winds today at Rogart in in the Highlands. He was taken to hospital with a suspected fractured rib. 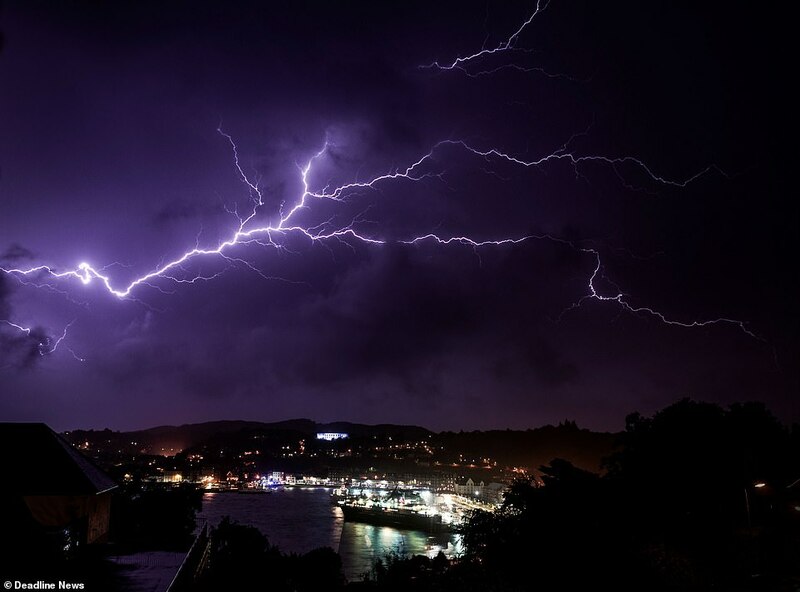 The storms continue a rollercoaster year of weather in Britain, which has already brought the joint hottest summer on record, the hottest April day since 1949 and widespread snow disruption from February's Beast from the East. ESB Networks, which oversees the power supply, said approximately 250,000 homes, farms and businesses were without power this morning. Crews were out and working towards restoring power to all affected families. There are around 65,000 homes without electricity in Northern Ireland. NI Electricity said it expected that number to rise throughout today as Storm Ali sweeps across the region. School pupils have been banned from walking home in part of Scotland over safety fears due to Storm Ali. Dumfries and Galloway VOST (Virtual Operations Support Team) said some children had already been injured by flying debris. The network provider said 70mph winds had seen trees, branches and other flying debris bring down power lines and poles. The majority of faults were located in the Omagh, Dungannon and Enniskillen areas. 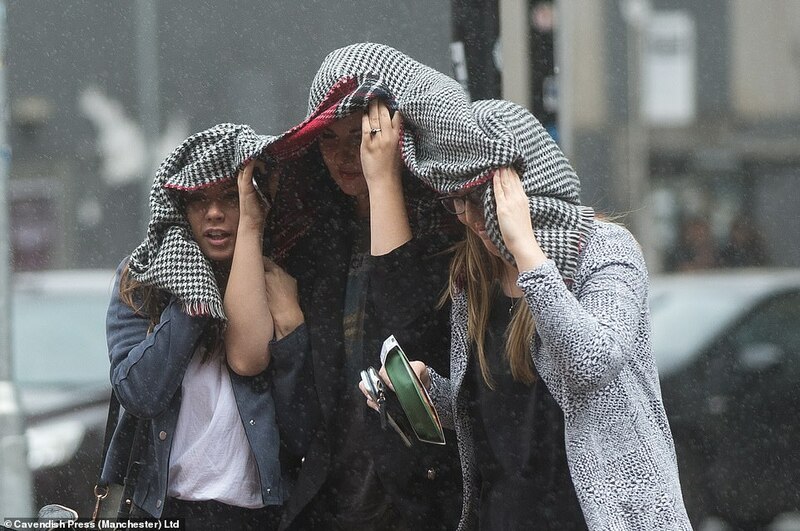 Ali also began to make itself felt across Northern Ireland and parts of Scotland and England with 60mph winds as the first named storm of the season arrived in time for the morning rush hour. 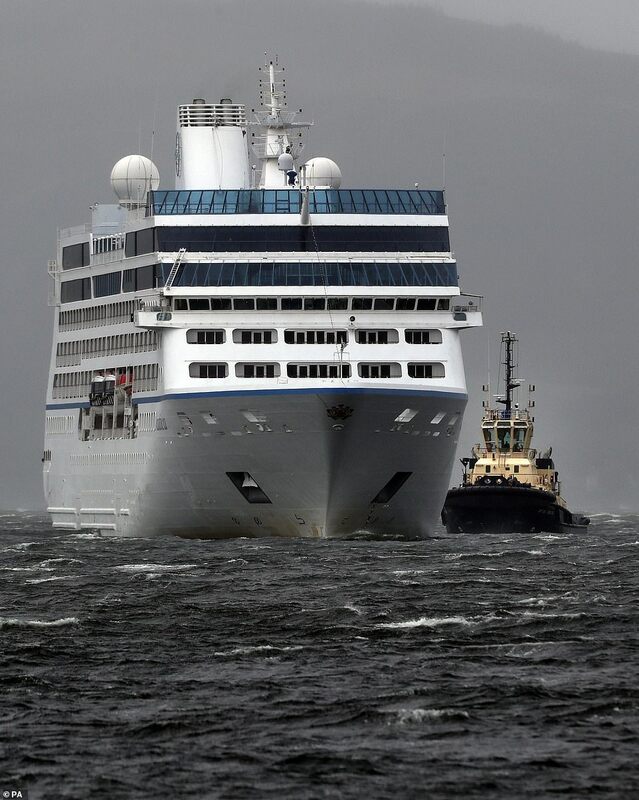 The cruise ship which become detached from its moorings in strong winds at the port of Greenock, Inverclyde, had 504 people on board. 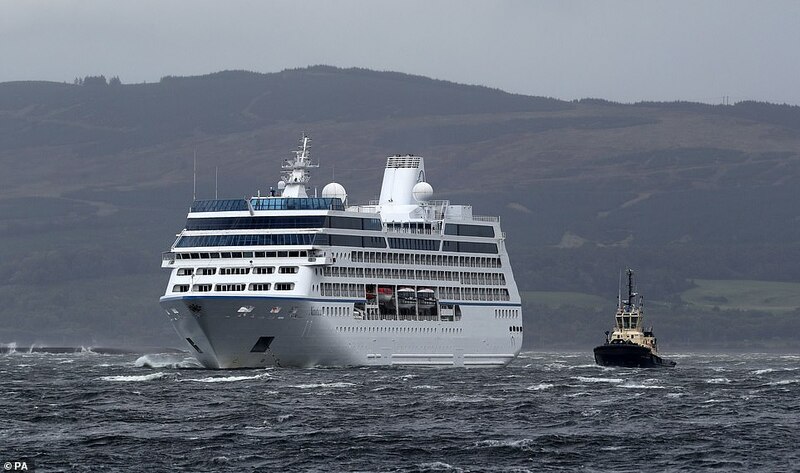 A statement from Oceania Cruises, which runs the Nautica, said: 'This afternoon, while alongside at the port of Greenock, Scotland, Nautica encountered extremely strong winds which resulted in the parting of mooring lines and the vessel being detached from the dock. Rail, roads and ferry services have all been affected by the severe weather conditions - with a major impact being that all vehicles and pedestrians have been stopped from using the Forth Road Bridge. The Queensferry Crossing has been shut to high-sided vehicles and double-decker buses, while restrictions were also put in place on the Skye Bridge due to strong gales. 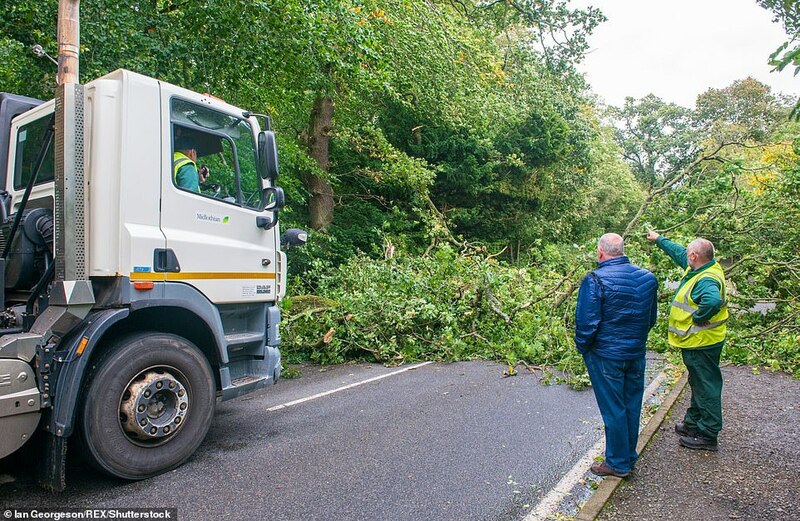 At around 10am part of the A75 in Dumfries and Galloway, near the Collin bypass, was blocked for about an hour due to a fallen tree. Officials in Dumfries and Galloway reported similar incidents had occurred across the region. A section of Princes Street in Edinburgh was closed after parts of a shop roof flew off in strong winds. Police Scotland was alerted to lead falling from the Topshop building at around 12.30pm today. A cordon has been put in place. Meanwhile, South Bridge Street has been shut between Chambers Street and the High Street after lead fell from the Tron Kirk at around 12.10pm. There have been no injuries in either incident. ScotRail said the storm was causing disruption to services, adding that there was a tree blocking tracks at Dumbarton Central which damaged overhead wires, and overhead wire damage at Partick. Traffic Scotland said the Forth Road Bridge is closed to all vehicles and pedestrians. 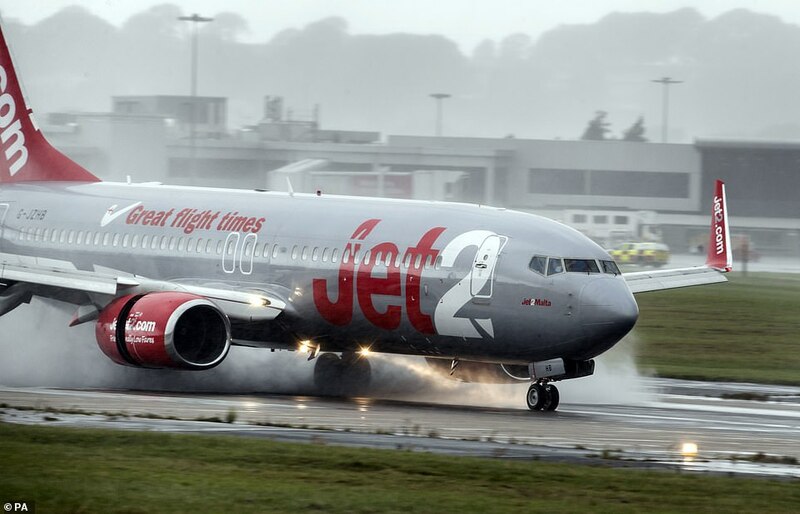 Dublin Airport said the storm would have an impact on its schedule with more than 70 cancellations and 10 diversions. Photos posted on social media showed trees down in Galway, while Dublin Fire Brigade posted about falling trees damaging cars, with one photo showing a smashed windscreen. Passengers travelling between Perth and Inverness on the Highland Main Line were hit by major delays due to a freight train that was derailed after striking fallen branches near Culloden at about 1.40am. 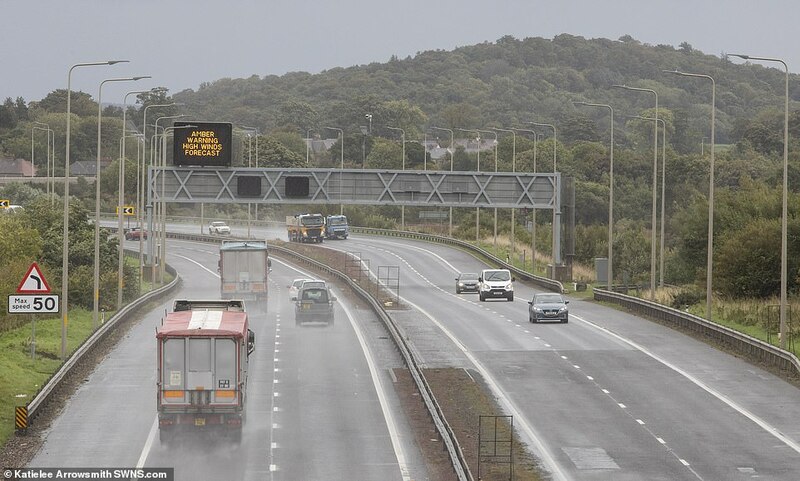 Cars and lorries drive along a road in Scotland as the country braces itself for the impacts of Storm Ali todayTwo wheels of the freight train came off the track and NetworkRail Scotland said specialist engineers and equipment will be used to re-rail the train. ScotRail told passengers to use services via Aberdeen if possible. 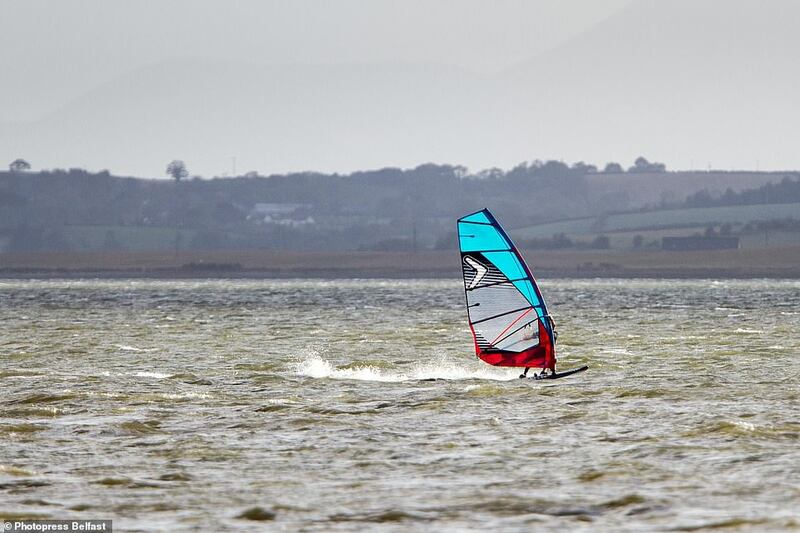 Meanwhile fast ferries across the Irish Sea were cancelled as gales battered Wales. Stormy weather also stopped a helicopter reaching a walker who complained of a hip injury near the bottom of the Idwal Slabs in Snowdonia. The coastguard helicopter tried to reach him but the winds were too severe for a safe approach, so Ogwen Valley mountain rescuers was deployed with a stretcher. He was treated on scene and then carried back to the road. 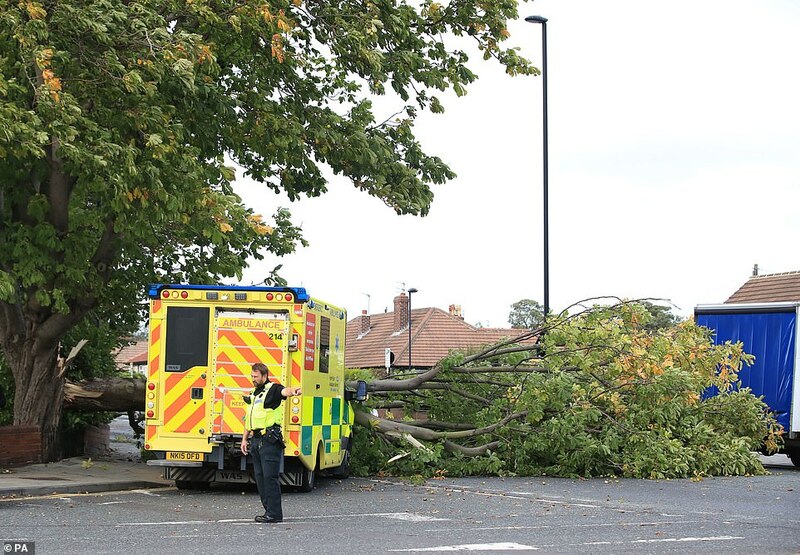 Northern England also took a battering form Storm Ali, with traffic disruption, power cuts and fallen trees blocking roads from Merseyside to Cumbria. 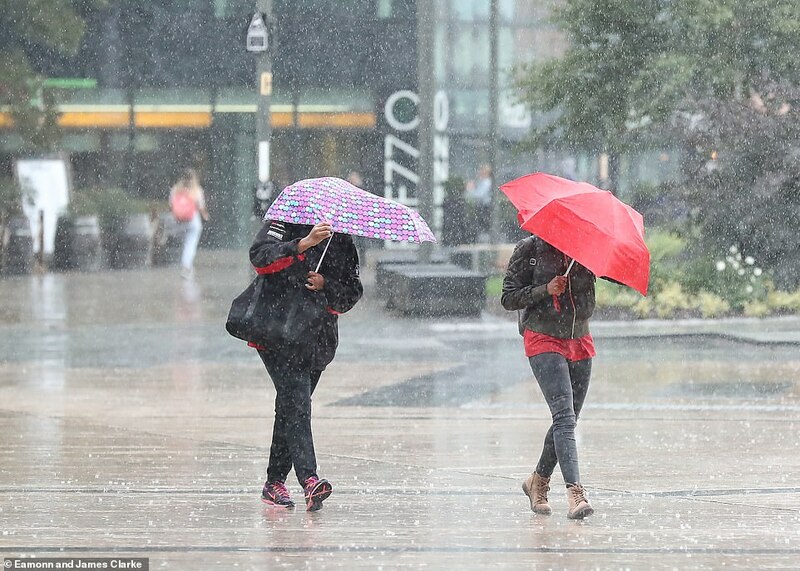 The Met Office put in place a number of Amber and Yellow warnings for Cumbria, warning people to secure garden furniture, be aware of flying debris and take extra care on the roads. 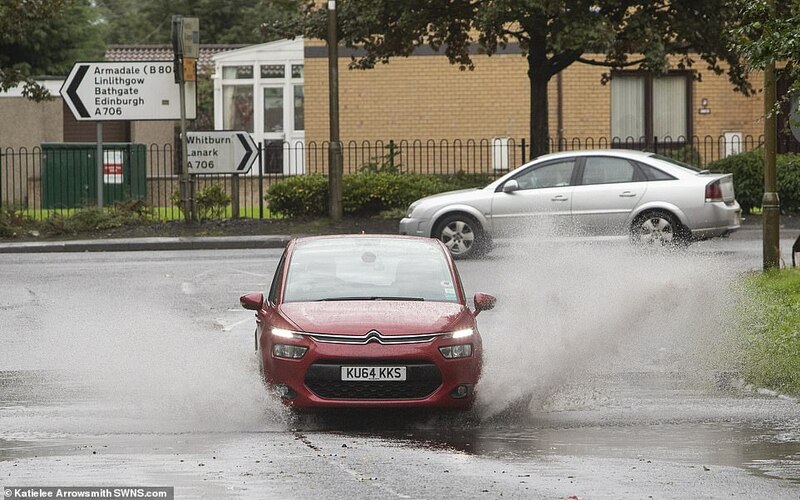 Highways England has also issued a severe weather alert for north-west and north-east England. 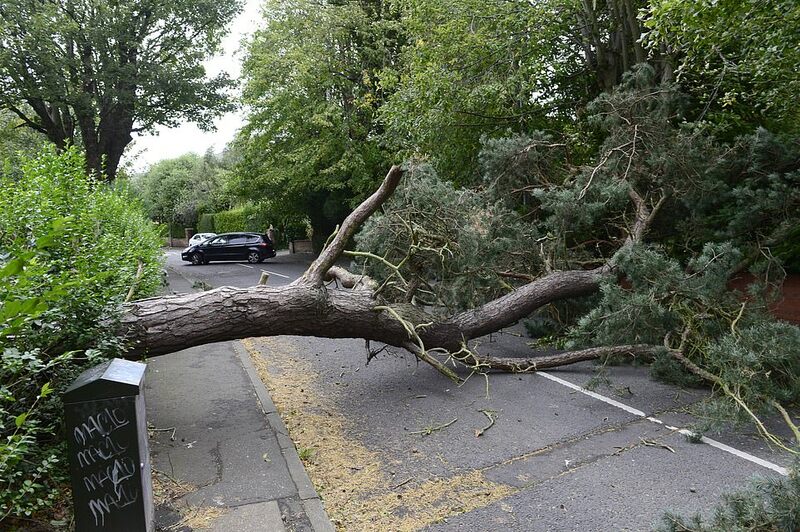 A fallen tree blocked a major junction in the Aintree area of Liverpool, with motorists advised to avoid the area. The A66 in Cumbria has been closed in both directions between the M6 and A1M due to high winds, and the A628 Woodhead Pass between Manchester and Sheffield has been closed to high sided vehicles. The M6 was also closed northbound between junctions 43 and 44 after an HGV was blown over. Police warned the road may be closed for some time and asked the public to drive only if absolutely necessary.Six areas of Carlisle have also suffered a power cut with Electricity North West engineers working to restore supply. Superintendent Mark Pannone of Cumbria Police said: 'We are getting a high number of calls about disruption, with trees down on some roads. We would urge people to be aware of their surroundings and take care. There is also potential for damage to buildings, fallen trees, travel cancellations, road closures and large waves in coastal areas. In Northern Ireland, the M1 motorway was closed in both directions just west of Belfast due to fallen cables, the Police Service of Northern Ireland (PSNI) said. 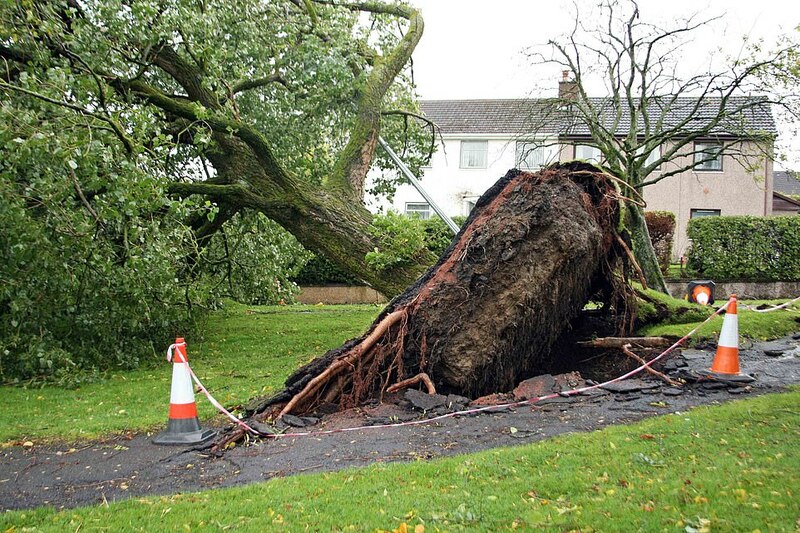 Saintfield Road in Co Down was also closed at the junction of the old Ballynahinch Road due to a fallen tree. 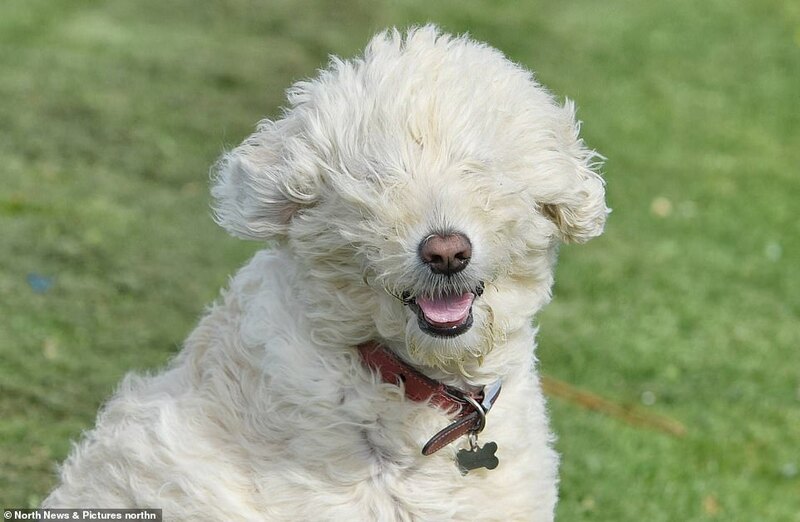 As Ali rolled in this morning the Met Office updated its amber weather warning of wind, saying there is now a high likelihood of impacts across a swathe of the country. 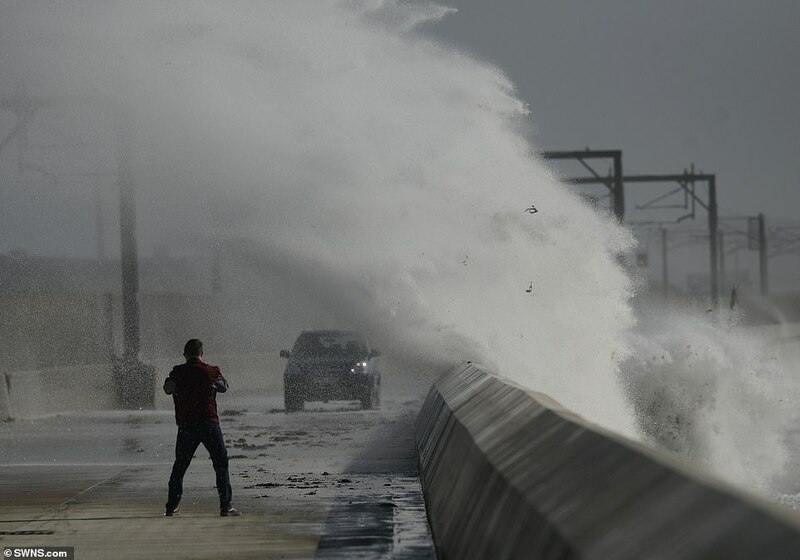 Gale-force gusts began to be recorded on the Galway coast as heavy rain moved in, although the worst of the weather was not expected to be seen until later this morning. Choppy seas have thrown the filming of Aidan Turner's Poldark scenes into doubt. A source inside the production said Turner was due to film scenes on a boat just off Charlestown harbour in Cornwall around 10.30am today - but the weather affected this. There was filming on the pier all morning with what appeared to be Jack Farthing, who plays George Warleggan. Crew members have been seen going down to the shoreline to look at the beach and waves. Crowds of onlookers lined the paths around the village as winds picked up, as crews were looking at alternative scenes to shoot while waiting for the seas to calm down. Local coffee shops were kept extremely busy by the show's workers looking to keep warm. 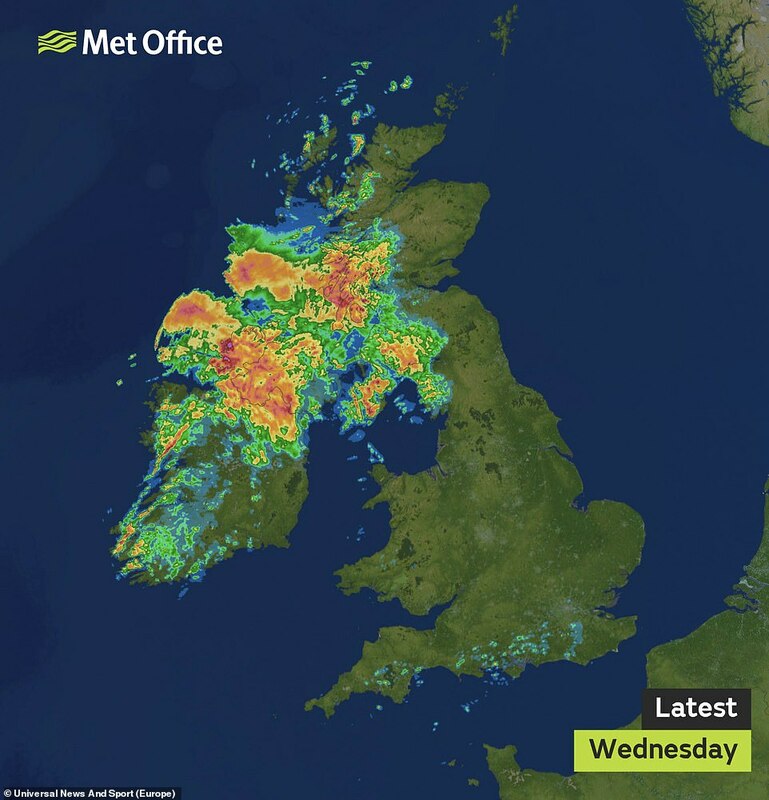 Met Office meteorologist Mark Wilson said: 'Storm Ali is already bringing some pretty heavy rain across Northern Ireland and south-west Scotland and is just starting to creep into north-west England. The worst of Ali's weather is forecast to be in the north, although areas outside the official weather warnings are unlikely to escape wet and windy conditions. While southern parts of England and Wales could reach continued unseasonable highs of up to 75F (24C), it will feel cooler due to the strong winds, Mr Wilson said. 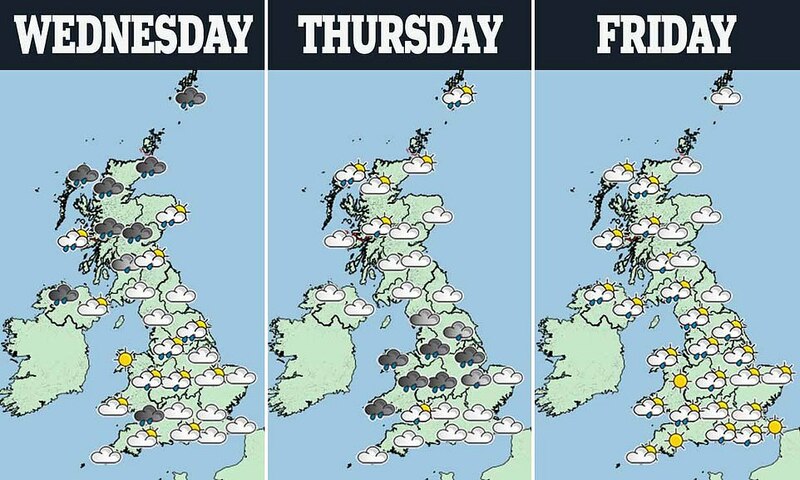 The unsettled weather is due to last right through the week, but an improvement is expected early next week as drier weather is set to take hold. Irish forecaster Met Eireann said the strongest gusts as of 5pm were 91.3mph (147km/h) at Mace Head in County Galway, 77mph (124km/h) at Newport, and 74.5mph (120km/h) at Claremorris, Co Mayo. 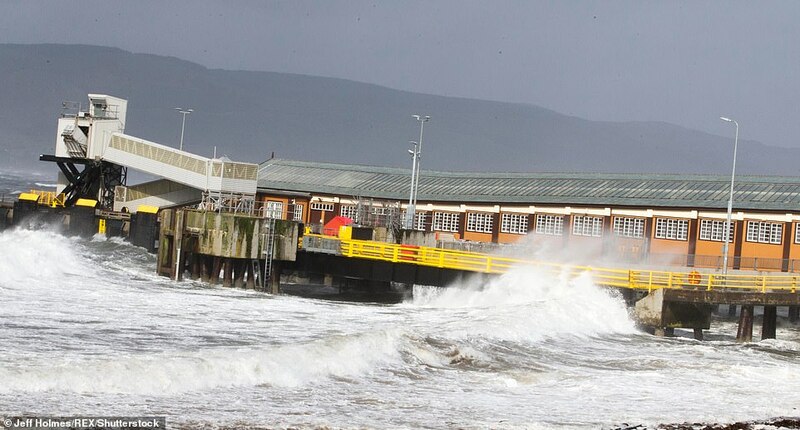 In Northern Ireland, the Met Office said gusts of 91mph hit Killowen in County Down. The season's names have been compiled from a list of submissions by the public, choosing some of the most popular names and also selecting those which reflect the nations, culture and diversity of the UK and Ireland.